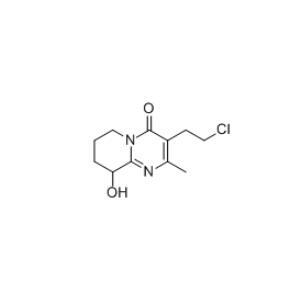 Paliperidone Intermediates CAS 130049-82-0 is high purity and low price with the molecular formula of C11H15ClN2O2 and formula weight of 242.7. The Paliperidone Intermediate CAS NO 130049-82-0 soluble in chloroform and methanol, and the melting point is 100-102 ℃(lit. ).3-(2-Chloroethyl)-6,7,8,9-tetrahydro-9-hydroxy-2-methyl-4H-pyrido[1,2-a]pyrimidin-4-one is the chemical name of Paliperidone. Paliperidone is a dopamine antagonist and 5-HT2A antagonist belonging to class of atypical antipsychotic agents. Looking for ideal 130049-82-0 Manufacturer & supplier ? We have a wide selection at great prices to help you get creative. All the CAS 130049-82-0 are quality guaranteed. We are China Origin Factory of CAS NUMBER 130049-82-0. If you have any question, please feel free to contact us.